For my purpose here, “sacred” means being devoted to one important purpose or use that is worthy of being treated with respect and care. For example, as the purpose of a charitable organization is sacred. “Spiritual” means that it relates to or affects the human spirit or soul. But, to what does “spiritual intelligence” refer and what does it have to do with meetings? It seems that spiritual intelligence is, at least in part, what occurs when we think together and allow ourselves to touch and be touched by intelligence that comes from individuals, the group as a whole, and from the surrounding context or field in which people are talking. Context includes the culture of the organization or the community along with the tone and atmosphere that you create as a leader or you contribute to as a participant. Are the purposes of your meetings sacred? Are they worthy of respect and care? Do your meetings engender spiritual intelligence? Do they help people think and ponder together; hear each other; and touch and be touched by the intelligence that is needed? Making your meetings sacred practice combines at least three elements: your commitment, your practice, and the meeting process itself. Your commitment could be to find the sacred in the mundane, to plan and lead meetings with respect and care. 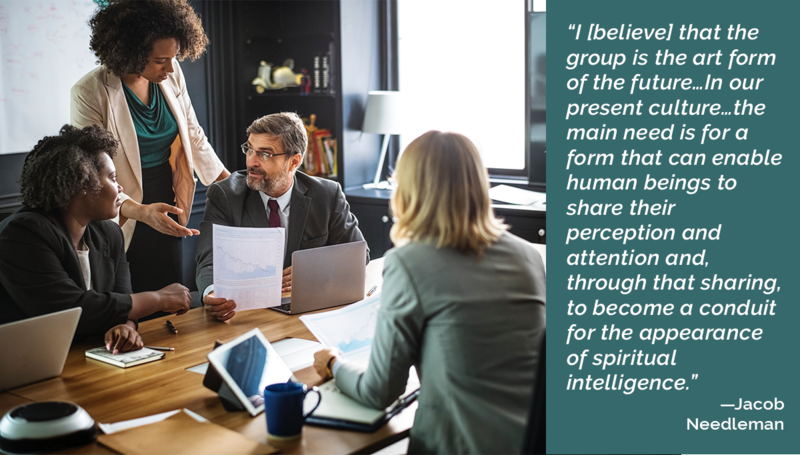 For example, could you plan and lead meetings in a way that enables people to “share their perception and attention” and become conduits for a different, even spiritual, intelligence? Even when the topic of the meeting itself might appear to be mundane? The process of your meetings could include elements that encourage people to think together, hear one another, and be touched by what they are hearing and open to an intelligence that is emerging from individuals, the group as a whole, and the context in which you are meeting. Many of my blogs include tips and tools on how to design and conduct meeting for this purpose. Taking a slow, gradual and incremental approach is often the best strategy. I encourage you to take 30 seconds right now to ask yourself, “What is one small step I could take to make my meetings sacred practice, and to engender “spiritual intelligence” during them?” Note down your thoughts. * The inspiration for this blog comes from “The Leading as Sacred Practice” program of The GLEN. I must admit that, although it seems correct to me, I would avoid to use the word “sacred” with many groups I facilitate. It seems too far of their way of thinking at the moment. Your mention of “The Leading as Sacred Practice” pointed me to Anne Dosher and her definition of sacred as “that which has value in and of itself and gives meaning to the whole.” I think the word “valuable” conveys more or less the same idea as sacred and I would be more comfortable with valuable than with sacred. Can we make every meeting valuable for every participant, during the full length of the meeting ? That would be a revolution in many organizations. Anne Dosher, in the true spirit of the World Café, “views life itself as a conversation”. I personally like to design meetings as “fruitful conversations”. Maybe “valuable conversations” ? Providing inspiration, tips and tools for leading, creating change, and fostering constructive conversations about consequential questions.